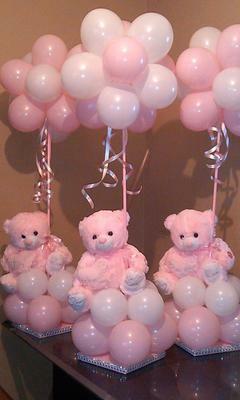 I'm looking to make balloon centerpieces for my baby shower. What would be the best size balloons for a table top balloon centerpiece? Are 5 inch balloons ideal for the small round balloons? And what size should I get for the long swirled balloon to wrap around the stick if my balloon stick is 20 inches? I am assuming that you are talking about an air filled centerpiece, like a balloon topiary tree? I am uploading an image to illustrate what I mean. For this kind of centerpiece, 5 inch balloons are the right size to use. For decorating the stick, you'll have to see whether a 160 or a 260 twisting balloon will work better. Both are 60 inches long, but the 160 is smaller in diameter (1 inch vs 2 inches).